Skype is hiring a whole lot of engineers. Many of them will work on the company’s mobile applications, as we reported earlier this week, and many will work on cloud-based implementations of Skype that would include working with third parties such as LinkedIn. This hiring binge is part of Skype’s big expansion in Silicon Valley, something I wrote about in July 2010. We’ve gone from just a few engineers here this time last year to nearly 80 engineers, and they are coming from all over, including from the big name Valley companies too. Times are tough with the talent wars, but we’re determined, and we’re only just at the beginning with plans to significantly scale up our engineer workforce in Silicon Valley. And, while the perk of a 10 percent raise or spot bonus sounds good, it’s also about getting a great opportunity on the ground floor, working on really cool stuff that can make a huge impact. Skype for Business. Skype is trying to compete with Microsoft’s Lync (s msft): a set of technologies that allow you to communicate, collaborate and socialize with others, especially in business environments. Skype hasn’t been shy about its own business ambitions, and in previous interviews, had indicated it’s going down this line, where it would become the hub for such collaboration. Skype understands today’s work goes beyond just desktops, which is why it needs to support browsers along with mobile platforms. Andy Abramson, a well-known VoIP blogger, points out he has gotten similar indications from Dr. Jonathan Rosenberg (Father of SIP) and Skype’s GM for Skype for Business David Gurle (ex-Microsoft), two respected names in the voice-over-Internet community. Skype for Business has the potential to transform the enterprise telephony landscape, especially if Skype doesn’t fall prey to old thinking. It would need to think beyond PBX to have a lasting impact. Sure, some of the traditional companies are going to ignore Skype – they will any way – but it would be a good way for Skype to grow-up with the customer base which has made them so successful: little businesses of today. Thousands of startups that use them for communication will be more open to Skype’s presence and IM services, video services, its collaboration platform and possible scheduling features. Folks at Facebook recently showed us how to re-invent the email inbox by transforming the tool (the email inbox) to fit the user behavior. I hope Skype does precisely that. Skype as a Platform for growth. Taking a page from Netflix (s NFLX) platform strategy, Skype is looking to transform itself into a platform. In a conversation before he left the company, former CEO Josh Silverman told me the main reason why Skype was expanding in Silicon Valley: It saw an opportunity to expand its footprint, in other devices and consumer electronics, for example. “There is a huge demand for us to build Skype into other people’s experiences,” Silverman said. Just like Netflix, Skype needs to embed itself in many places for people to start using its dialtone to make calls to non-Skype numbers and thus bring in the dollars. This is an area where the company is looking at an uphill climb. Graphic by Phil Wolff via Flickr. 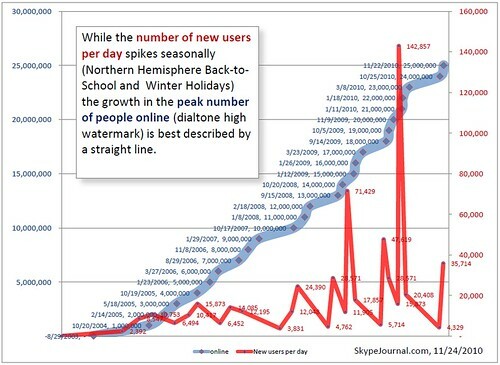 Phil Wolff, in a recent blog post over on Skype Journal raised some potential questions about Skype’s growth when Skype announced that 25 million users connected to the Skype network on a recent Monday. Wolff pointed out it took seven months for the service to show 9.1 percent gain in daily online users. In other words, it’s likely Skype is hitting a ceiling of usage of sorts, mostly because it’s now competing with many different communication-centric Internet services like Facebook and Twitter. Perhaps in order to overcome these issues, Skype needs to go partner up with different web players – like LinkedIn and Facebook (already in place) — to find new growth opportunities. So perhaps now you know why Skype is on a hiring binge. I agree that Skype needs to become ubiquitous, but partnering up with Avaya ain’t exactly small potatoes in the enterprise communications world. Much like Apple has finally done with the iPhone and iPad, Skype is realizing that future growth won’t come from consumers but from larger companies that can buy services in bulk and will pay a premium for specific solutions. When you’re scalable and huge, why not pick off the easy money in big chunks? I thought Skype was developed in Prague. True or false? The cynic may suggest that the only business Skype is currently in is an ipo for investors. FaceTime tango and a few others have shown skypes directory has no lasting value. The only piece still standing as really useful is multichat. Not sure we can even conclude or insure that Skype exchanges are even secure anymore. My mobile is now my point for global free communications. Skype is just one of many option now and not my preferred choice. The hope that enterprises will keep uses tied in is a pipedream. Skype exists because windows messenger sucked and didn’t kill aol or yahoo. Apple and google aren’t about to make the same error. Perhaps I’m missing it. I can’t see any reason to really care about having Skype dial tone today. Particularly as a new user. Companies like skype, microsoft, and, of course, google are finally legitimizing cloud based computing. This should be interesting. I think Skype has a potential of being disruptive but I fear that they might be chasing the big corporation opportunity too hard and might forget their core strengths — small and indy companies. And Wikileaks just reminded everyone that storing all your info on someone else’s servers means you are dependent on others. You say cloud computing, many say its the completion of a loop back to the mainframe. For users who are willing to give out all their personal infos at the drop of a hat online, its probably not a poblem. Companies on the other hand arent that keen. This new concept (!!!) takes the computing power back out of the hand of consumers and puts it back into the hands of the internal IT employees and third-party vendor. I can count on two fingers the amount of clients (to be fair, theyre tech companies so they ahve strong IT dept) that Ive come across that are willing to shift their enterprise to the cloud. That said, it would be nice for Skype to have a little go at the enterprise. It truly is a universal apps taht works on all our OS here at work (Linux, OSX, WinXP) but the browser is the key. Get rid of the app as necessity and use the browser and it will be a game changer. They use the word “ground floor” but I don’t think they know what it means. Hi Om — this article makes me think of OpenTok by Tokbox. They pivoted their browser-based video chat into focusing more on the platform. You mention “Just like Netflix, Skype needs to embed itself in many places for people to start using its dialtone to make calls to non-Skype numbers and thus bring in the dollars.” OpenTok lets you integrate video chat into a variety of applications, and gives the developer a lot of control of its implementation and look. I’ve always longed for Skype to support more people being able to ‘dial-in’ to a conference; Tokbox seems to be more scalable in that sense. Anyway, it’s a shift that seems inevitable. Let’s see how Skype executes it. I am going to be learning more about Tokbox at our Net:work conference later this week and perhaps would share my thoughts after that! All very cool, but maybe they should focus on the platform they’ve got first. I gave up on Skype a few weeks back and moved to oovoo in part because I’ve had some software issues appear out of nowhere, and finding support was impossible. Delete and reinstall didn’t help either. So, no matter how many bells and whistles they add, they’ve already lost me. “Forward” isn’t always progress in this business.